Fullfilled by imported Thailand PP cotton filling material, which is Meets or Exceeds Product Safety Standards, Non-toxic and Non-allergic Artificial Fur. Feather-soft microfibers wrapped in soft-plush fabric for the ultimate comfortable in travel. U-shape design conforms to head and neck. Easily fits into backpack or travel bag. Relieves neck pain during travel or working. Fluent line, vivid facial expression, soft hand-feeling, High Anti-destructive force, Not easy to broken, non-pollution to environment. The perfect combination of refine on quality and art. Surface-washable construction for easy cleaning. Great gifts for kids of all ages, can be used for the baby early education, baby bed accompany toys. Perfect as kids toys,birthday gifts, holiday gifts, home decoration. cute for girlfriend. Add to your collection to build up your Pet family. Soft plush is great for cuddling. We promise 1-Year Money Back Guarantee and Lifetime Limited Product Warranty. If You're Not Completely Satisfied, Simply Let us Know and You'll be Offered a FULL Refund or Replacement, No Questions Asked. MATERIAL: Fullfilled by imported Thailand PP cotton filling material, which is Meets or Exceeds Product Safety Standards, Non-toxic and Non-allergic Artificial Fur. U-SHAPE PILLOW: Feather-soft microfibers wrapped in soft-plush fabric for the ultimate comfortable in travel. U-shape design conforms to head and neck. Easily fits into backpack or travel bag. Relieves neck pain during travel or working. SOFT HAND-FEELING: Fluent line, vivid facial expression, soft hand-feeling, High Anti-destructive force, Not easy to broken, non-pollution to environment. The perfect combination of refine on quality and art. Surface-washable construction for easy cleaning. GOOD CHRISTMAS GIFT: Great gifts for kids of all ages, can be used for the baby early education, baby bed accompany toys. 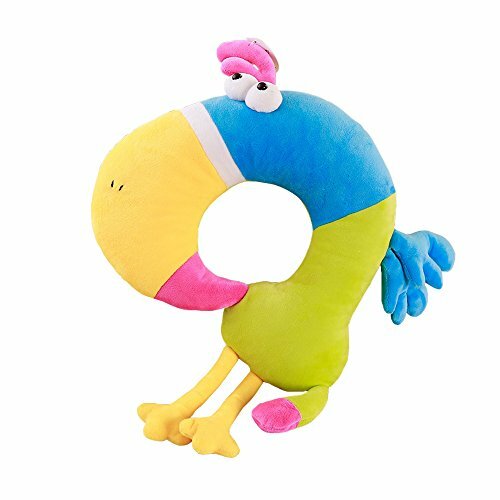 Perfect as kids toys,birthday gifts, holiday gifts, home decoration. cute for girlfriend. Add to your collection to build up your Pet family. Soft plush is great for cuddling. LOHOME WARRANTY: We promise 1-Year Money Back Guarantee and Lifetime Limited Product Warranty. If You're Not Completely Satisfied, Simply Let us Know and You'll be Offered a FULL Refund or Replacement, No Questions Asked.